Attract These Woodpeckers to Nest in Your Yard! The 3 Woodpecker House may be used by the Red-bellied Woodpecker, The Hairy, and the Red-headed Woodpecker. If you're already feeding and watching these birds now, why not encourage them to nest in your backyard also! 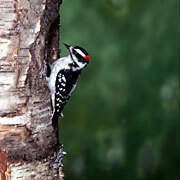 Most backyards don't have dead and decaying trees that Woodpeckers need for nesting. Offering this Birdhouse can be the solution to attracting these birds to nest and raise young in your yard. It stands 17-1/2"tall - 7-1/2"wide and 9-3/4" deep. The ideal size for attracting these birds to nest in your backyard. The fun you could have watching Woodpeckers raise a family in your backyard is something everyone can enjoy. This house comes with a slate predator guard. This keeps squirrels from enlarging the entrance hole. As woodpeckers are inclined to excuvate their own cavities, Wood chips are provided to encourage these birds to build their nest in your bird house. Side opens out for easy end of season cleaning. Most people don't get to see woodpeckers nesting and raising young in their backyards. Now you can attract these birds to your home for a whole season of woodpecker excitement. By ordering the Three Woodpecker House, you not only have a chance to watch these wonderful birds, you'll be helping all of us by making sure there are future generations of Woodpeckers for all of us to enjoy. Now you don't have to wait, Order yours today and get Woodpeckers nesting in your yard.